Dramatic and beautiful, yet comfortable and relaxed. 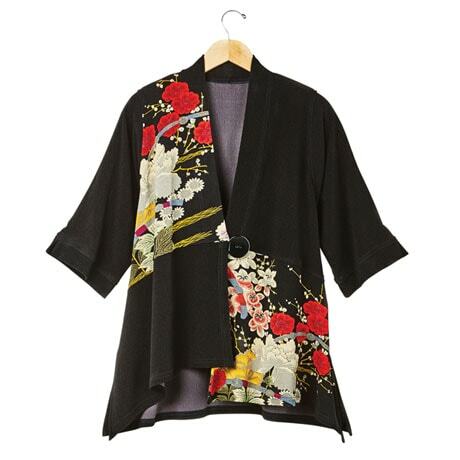 Black and printed bouclé pieced jacket has a stand-up collar, 3/4-length kimono-style sleeves, single button-and-loop closure, side vents, and asymmetrical hem. Acetate-poly-spandex blend. Size M hangs 30" in back, longer on the sides. Sizes S(6-8), M(10-12), L(12-14), XL(14-16), XXL(18-20).